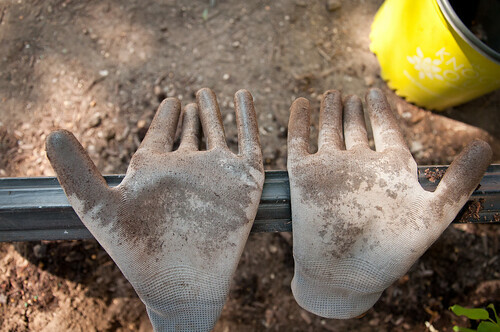 Volunteer Days is an annual event organized by Leadership Greater Washington (LGW) that focuses on giving back to the community. LGW is a nonprofit organization whose mission it is to identify and connect diverse local leaders in order to facilitate finding solutions to regional challenges. I got introduced to them through a few of my friends and colleagues and decided to help them out on their service day. I was reminded of the importance of effectively using volunteers during this outing. I arrived at 9am as instructed and found two adults and a student waiting outside of Martha’s Table where we were to do some painting. There was some miscommunication with a third-party that helped connect LGW with Martha’s Table and as it turned out there was nobody there. After a few phone calls we realized that we would have to wait until 10am to start. I didn’t care since I was planning on being there anyway. I was kind of tired too so I slumped down on the sidewalk and waited in a semi-conscious state. One of the other four volunteers was irritated that we had to wait and said he had better things to do and left. I get that he wants to be useful, but we had all planned on being there anyway, so what difference does it make right? I mean Martha’s Table is counting on us and it’s not their fault that we were there early. This provides a good lesson to organizations that use volunteers. Not everyone will share my view on this and many will feel like they have wasted their time and form a negative impression of the nonprofit in need. Everything worked out fine. 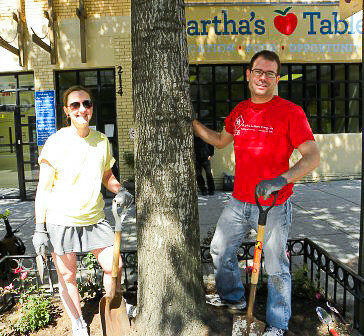 There was not enough of us to paint but Justin, volunteer coordinator extraordinaire, quickly came up with a project for us that involved freshening up the green areas in front of Martha’s Table. Pulling roots out is hard work! Who knew? We replaced about a dozen plants with beautiful new ones. I was really impressed with Martha’s Table and you should check them out! “We provide folks with a chance to live their values,” said development and community manager Kimberly Lyons-Briley. “Ultimately volunteers are some of our biggest advocates.” Well, I can understand why – everyone there is so nice! No more weeding for a while. Check back next Monday to learn about my experience volunteering with Lucky Dog Rescue! In the meantime, check out AARP’s blog this Wednesday. I’ll be starting a new weekly column on their site – but don’t worry, I’ll still be here too! If you want to help Miriam’s Kitchen but don’t live in DC, check out their Wish List on Amazon.com.